Kass Martin: Add it to the list! There are certain things I am very good at keeping clean and organized and then there are many places where I fall short. Growing up my room was nothing to be proud of. In fact, when Brian and I were dating my room was repulsive and somehow I still managed to get him to marry me. Clean clothes were strewn about when trying to find just the right outfit, things shoved under the bed, never wearing matching socks-that would have required more organization than I had...BUT once I got married things changed. #1 My van. Yes I drive a van. I drive the worlds greatest red mini van-it's trustworthy, runs great and it's paid off. Can't beat that. Brian once told me (and I am embarrassed to admit this haha) "If I didn't know you and I saw the inside of your van I would think you had NO personal hygiene!" Of course the kids contribute to this and now that he drives them around more than he used to I think he's getting a dose of empathy because his 4 Runner isn't so sparkly clean as it once was. #2 My purse. I can't keep this thing organized. I accumulate all sorts of crap: receipts, candy, gum, snacks, money, change, spare hair elastics, bobby pins, earrings, random kids things...You name it and it goes into the black hole. Anyway, in some magazines there are those articles of actors or models titled, "What's in your purse" or something to that effect. So I'll ask you, what's in your bag? 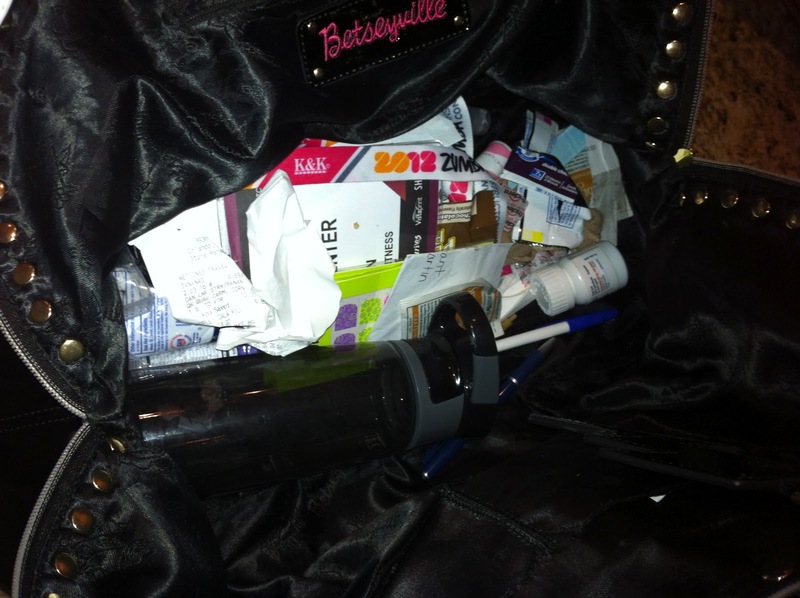 Here it is...this is a picture of my purse the other day. It's pathetic. I'm not proud, but after the pic I did clean it out, thankfully. Don't judge people. Like I said I have other areas I keep very clean. Maybe in time my purse will be something I add to the list. water bottle, 2012 convention presenter pass, water retention pill for my swollen feet when traveling, Vaseline (a must for my dry skin), a pen, receipts, Chill Pill travel speakers, herbal tea, Brown Sugar perfume roller so I can feel like me when I travel, back stage pass to So You Think You Can Dance, Zumba Nail Stickers. Haha. Purses are a lost cause for me. Everytime I get new or change I swear I will keep it neat. Im in the same boat as you. I can nevervfind anything in my purse but it is always in there somehow. 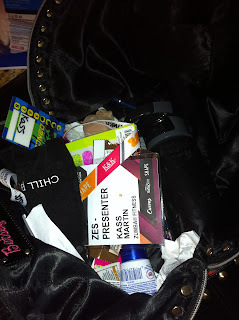 I havevit all from empty gum packs, Zumba business cards, receipts from life, apointment cards, granola bars, body spray & a planner that I never use! Good to hear you changed with marriage cause I am hoping to when I get married this July! Hola Zumba mamma! Doesn't matter what's in it ~ 2 thumbs up for the Bettsyville bag!!! Woop woop! :)) Much love from Zumba Fitness Sherman Oaks! Yay! Kass-love your blog! Lots of fun to get to know you more over the web since I don't make it to Gold's as often as I would like ;) Your purse is ummm...messy! (Those are actually the words my daughter said to me the other day) Ha!